A tall, glabrous annual, 2 to 6 feet high and much branched, more or less purplish. Leaves alternate, thin, ovate and elliptic, glaucous beneath, 1 to 3 inches long, blunt, the margins toothed. 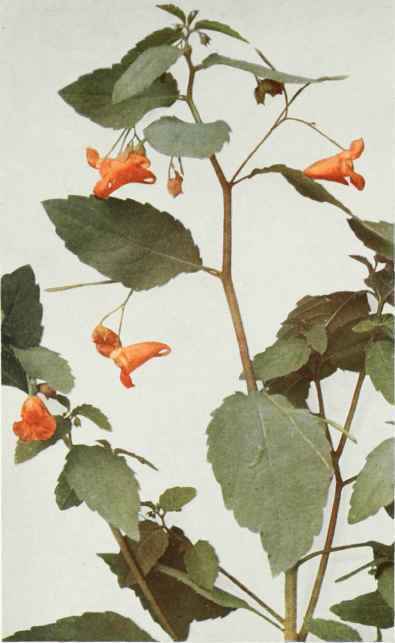 Flowers horizontal, orange-yellow, mottled with reddish brown, or rarely nearly white and not mottled, three-fourths to 1 inch long, on slender, pendant stalks. Sepals three, the two lateral ones small, green, nerved, the other one large, conic, petallike, saccate and spurred, longer than broad, contracted into a slender incurved spur, two-toothed at the apex. Petals three, with two of them two-cleft into dissimilar lobes; stamens five. Fruit an oblong capsule, violently and elastically dehiscent at maturity into five spirally coiled valves, expelling the oblong, ridged seeds. Also developing small, cleistogamous flowers later in the season. Low grounds, thickets, ditches, along streams and low, moist woodlands, Newfoundland to Saskatchewan, south to Florida and Nebraska. Flowering from July to September.